When checking your SpotCam video, you can see a blue bar below the image showing you those recording data available for you to playback. Sometimes you will see breaks in the blue bar like what below shows. 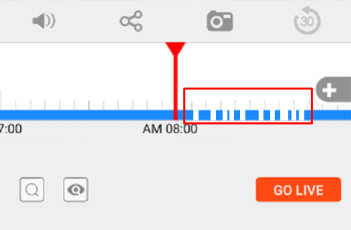 This kind of breaks mean recording data of that particular seconds is not received at server end, and you may not be able to playback video of that particular seconds. Please note this kind of breaks are usually caused by Wi-Fi network instability, or interruption of your internet service. In some cases this issue happens more during internet rush hours from after dinner to mid night. If you have enough bandwidth and strong Wi-Fi signal, also the internet service of your region/coutry is stable, then you shouldn't see this kind of breaks often. We will suggest you to check your Wi-Fi router and consult your internet service provider if you see this kind of breaks very often. You can also check another article related to this issue here.